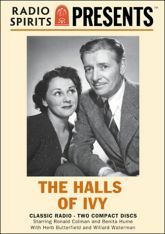 The Halls of Ivy was a gentle and literate comedy from the creator of Fibber McGee & Molly about the president of Ivy College. Starring Ronald and Benita Colman as Dr. and Mrs. William Todhunter Hall, the Colman�s breathed life into one of radio�s best and most memorable sitcoms. The Halls of Ivy also featured a supporting cast of first-rate radio veterans, including Herb Butterfield and Willard Waterman. Also appearing are Peter Leeds, William Johnstone, Alan Reed, and Arthur Q. Bryan.